My mom is an amazing cook. I think she gets it from her mother because my grandma is also an amazing cook. 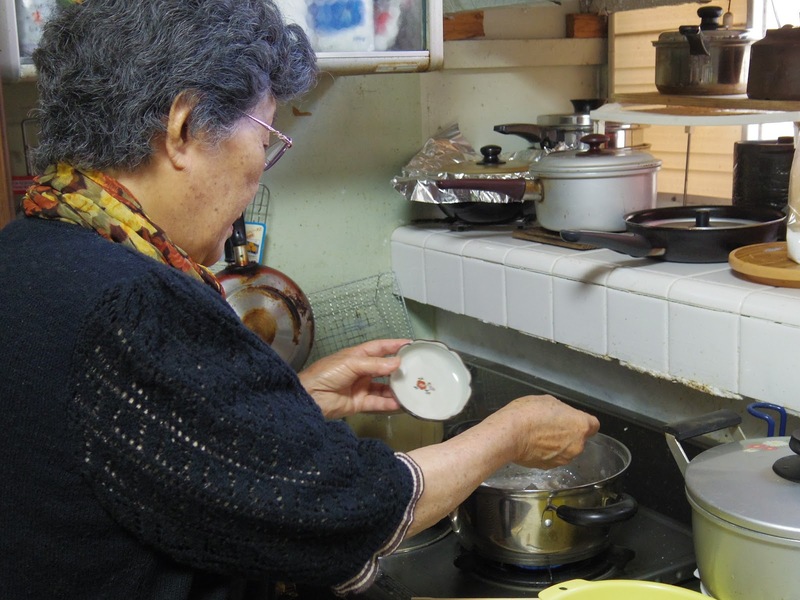 She spoils us with our favorite Okinawan dishes every time we come…and so I thought I’d share some with you. Fresh Aosa Soup (above) is delicious. 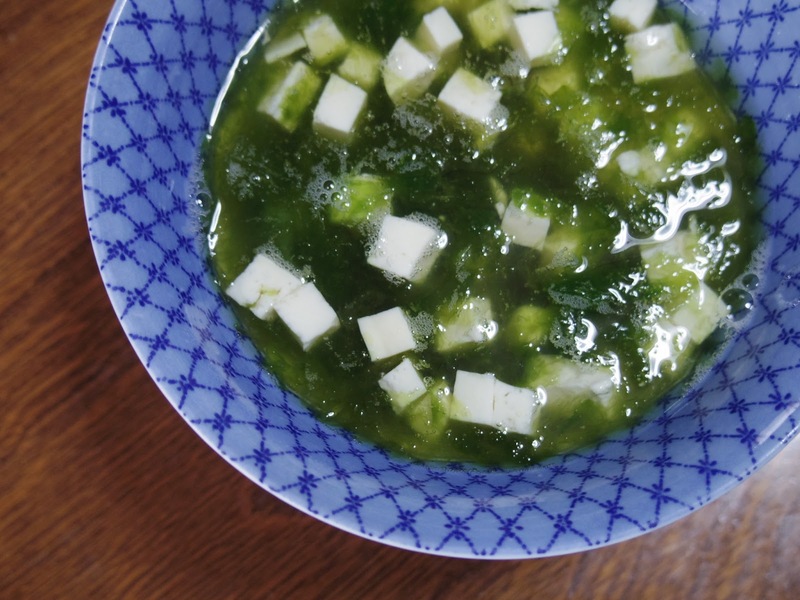 We had this in the mornings instead of miso soup. Aosa is a type of seaweed and fresh Aosa can be found in Okinawa, although you can find dried Aosa even on the mainland. But it’s really good. And it’s also good for your body as well because it includes lots of fiber and vitamin C! My absolute favorite dish is made from a type of potato called Tahnm (ターンム/田芋). 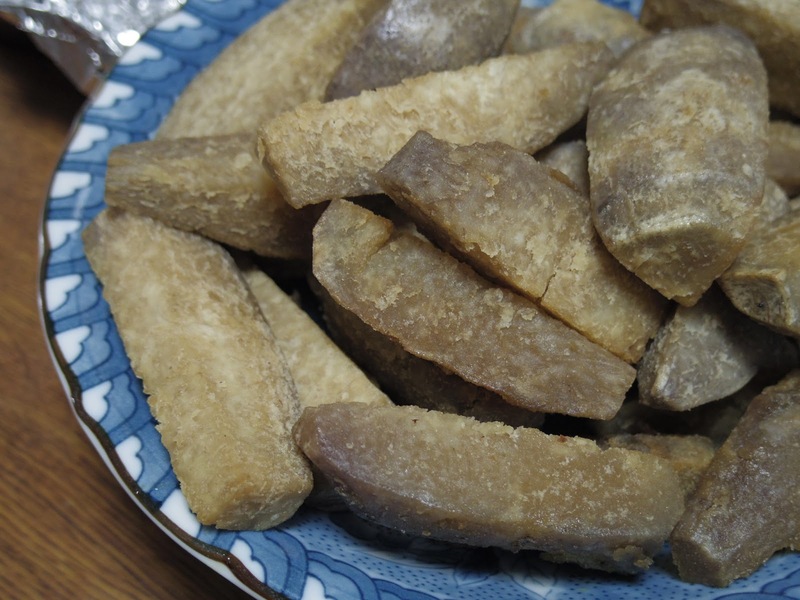 I think the closest type of potato may be Sato-imo (里芋), which is called Taro in English. It’s only produced in a couple of places even within Okinawa, so you can only find them in stores around certain holidays, like New Years or other Buddhist holidays. 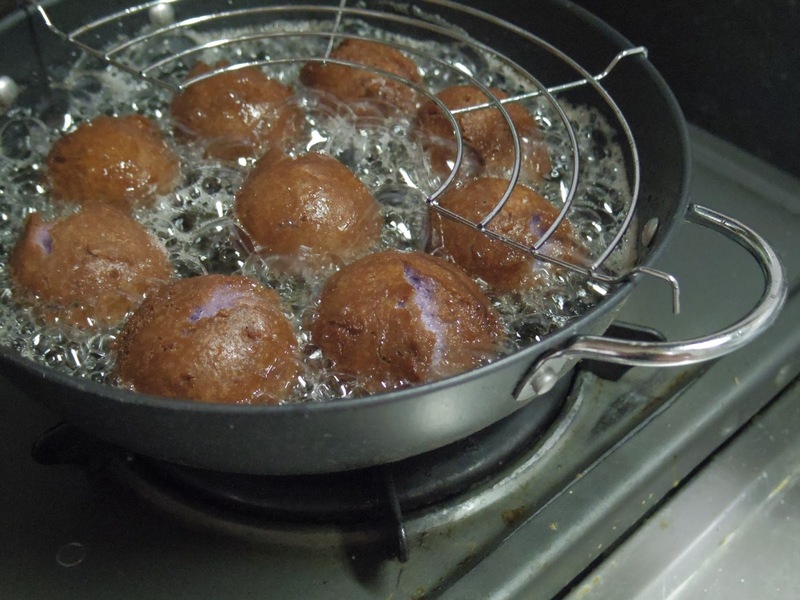 What I think is interesting is that the Tahnm are sold in stores already steamed (below). So cooking it is really simple. Tahnm can be used in a variety of ways. 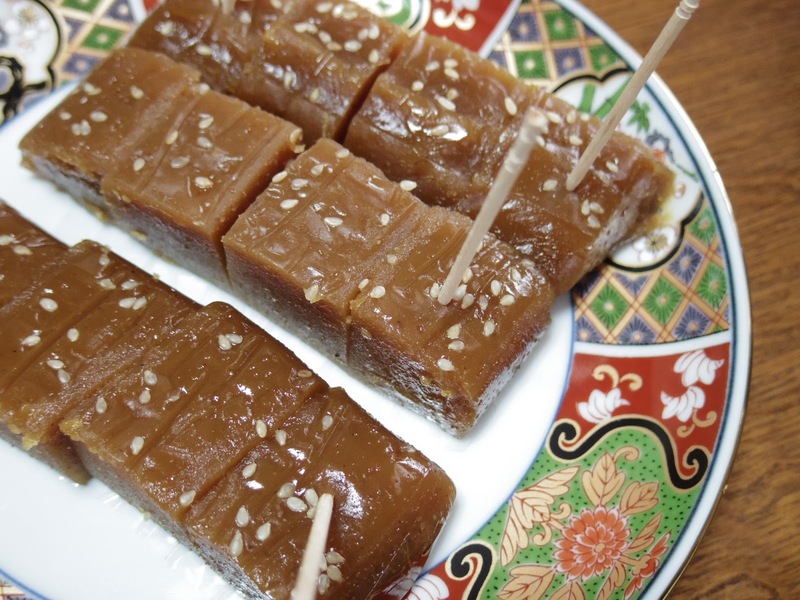 The two popular ways to cook it in our family is Dingaku (ディンガク), which is a sweet paste-like dish, and my absolute favorite, Kara-age (above). 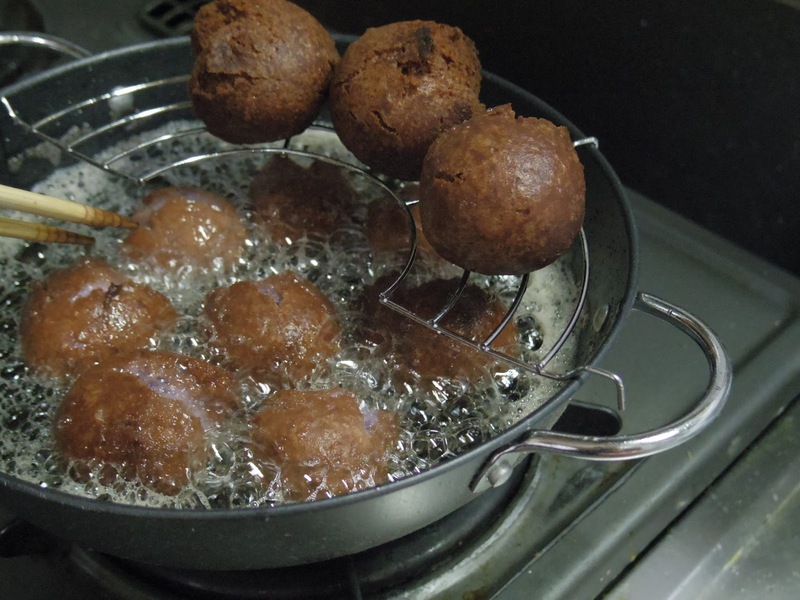 It’s basically deep fried Tahnm but you pour sweet soy sauce over it to add flavor! Nanto-mochi (ナントウ餅) is a type of mochi (above) made from kokuto (dark sugar), miso, and peanuts. 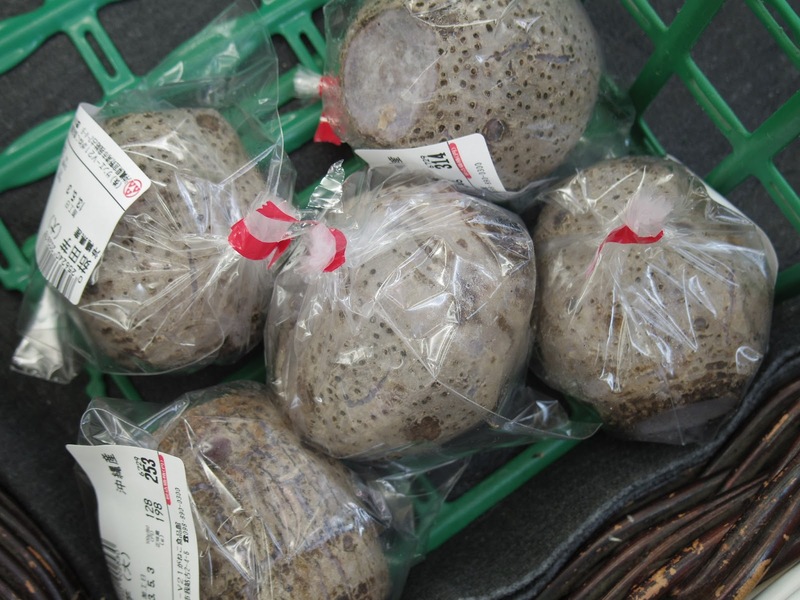 It’s not too sweet as it has a little kick of long pepper (called pipa-tsu (ピパーツ) in Okinawa) and ginger, too. It used to be a special dish for New Years but it’s become popular enough that you can find it all year long in Okinawa now. In Okinawan (they used to be the Kingdom of Ryukyu so they had/have their own language), Sah-tah means sugar, anda means oil, and agee means fried. So it’s pretty much a doughnut! 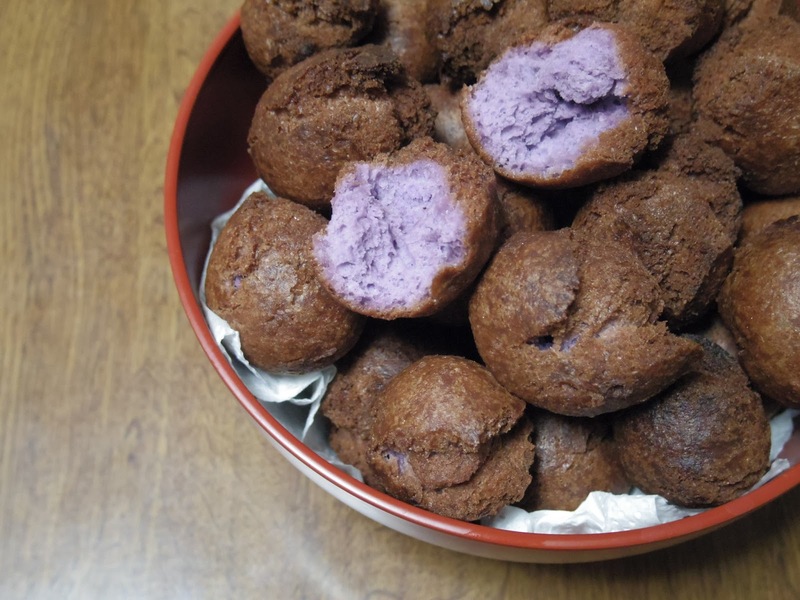 My grandma always makes the Beni-Imo (紅芋/purple yam) flavor. I love how purple the doughnut gets on the inside. Isn’t it pretty? Well, we ate much much more but that was all that I was able to take pictures of. The others? We scarfed it all down before I could even reach for my camera. haha. Okinawan food is so simple yet so delicious. And even more so when you’re in the company of family you love! everything looks good 🙂 thumbs up to your grandma ! I Googled (of course) “Okinawa shops Tokyo” and found one in Ginza called 沖縄わしたショップ. You been there? Doesn't it sound good? You'll love the combination! I agree completely. Guava or Sheequasah flavor frappuccino would be delicious in the summer!